When Julie at 627Handworks.com posted this block a couple of weeks ago I fell in love. It took me a week or so to work out how I wanted to approach the block and what colours I wanted to use. I ended up choosing red/pink combinations, but wanted to use so many more colours. For the first time I was really really frustrated by this sampler quilt’s limited palette. The FREE paper piecing pattern can be found here. 66 fabulous pieces to make this hexagon wonder. 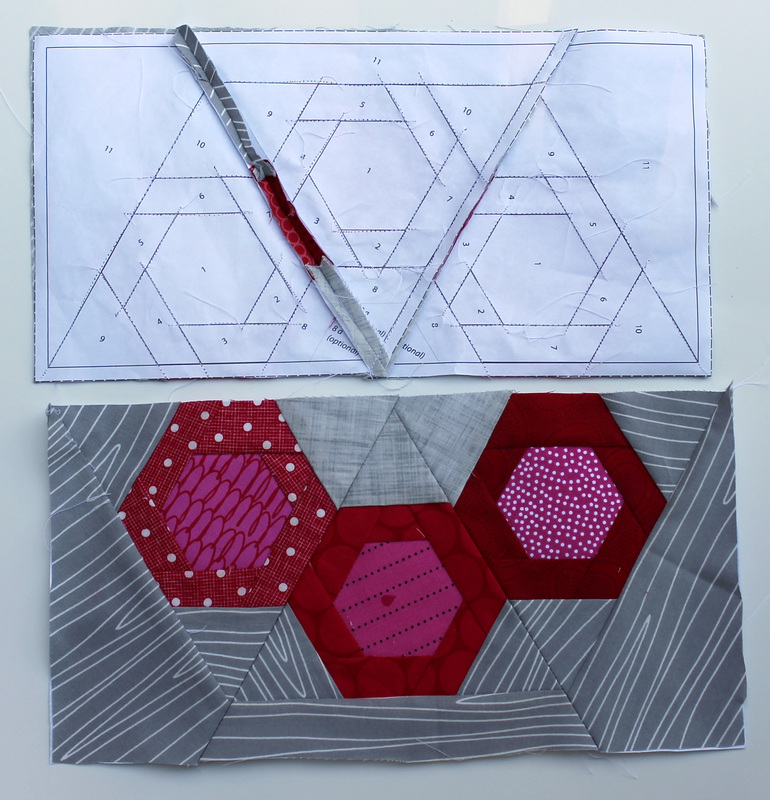 I have already started planning how I am going to use this pattern again – it is so effective and I am a little hexagon obsessed at the moment! I love this pattern. Great job on the paper piecing. I will be tackling my very first paper piecing project starting next week, so wish me luck! Good luck, not that you need it. Paper piecing is pretty easy and really addictive. Looks awesome! Love how the hexies pop off the grey background! The red and pink look so great on the gray! I can’t thank you enough for making these! What a great block- and you are right. So many great combos would work with this! This would be a great block for me to get some hexagons in without doing individual ones!! It is the perfect fix for a hexagon urge with out all the hand sewing. Awesome block! I have GOT to learn paper piecing. It’s lovely! You really made it sing with your color choices. Nice work! I was in awe of your control of the stripe print; then when I learned it was paper pieced, I was in double awe. A great block. I can’t wait to try this one….turquoise and reds I think. I love that combination! Great block and Simon&Garfunkel still rock in my book! I grew up with them too. Love the idea of turquoise and red with this pattern. Please post your end results so I can see what you did with the pattern. what a fabulous block! love the color combo you chose! Wow that hexi block is amaaaazing – I love your colour choices and look forward to seeing what other combinations you come up with. Wow! Love this block. I want a whole quilt of em. Your colors are perfect as usual. Thanks for the link to the pattern. This would also look great on a tote bag! A tote bag is a great idea. It is such a fun and interesting pattern I can not wait to see what others do with it. Can you please tell me what sort of paper you use for your patterns? Is it just plain old photocopy paper or is it something else? I use photocopy paper because it is convenient, cheap and easy. I am about to try tracing paper, it was recommended to me recently so I will see how it goes. gorgeous block!! It is a fun pattern but the colors you chose are so eye catching!! That’s definitely a way to create fun hexagon patterns. Wow! Love this!!! Beautiful fabric choices and what a fabulous pattern! What a great pattern! Love the fabrics you chose for it… hmmm might need to give it a go myself! Hi nice to meet you and sorry I am so late to the blog hop party. You have made some really lovely things. Hello! So happy to have found your blog. I got lost looking through past articles and your free PP patterns! 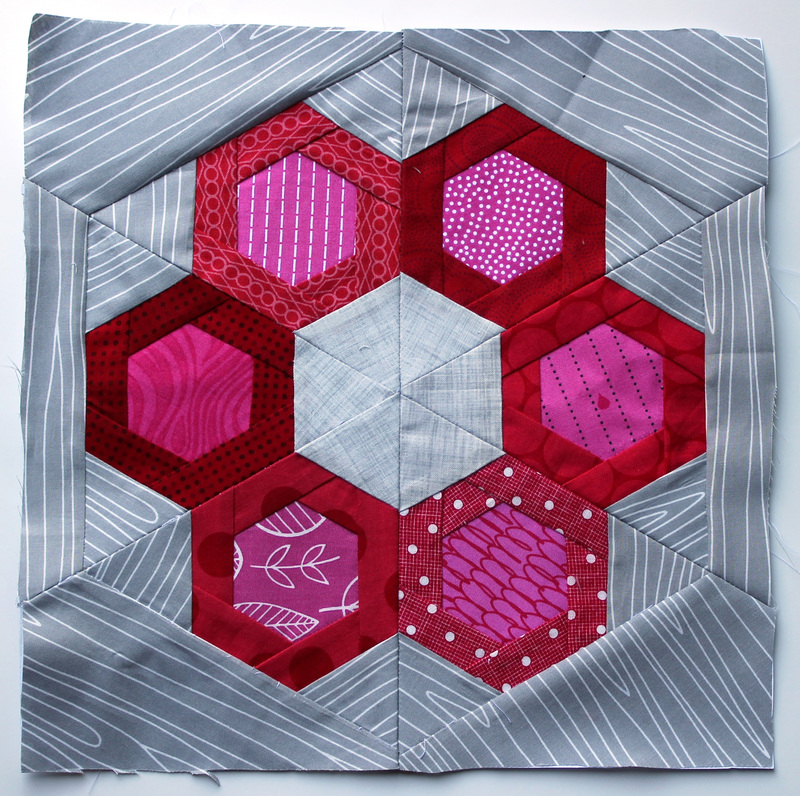 Although I am not a hexie person, I do love this block and have downloaded it from your friend’s blog site. I may not make more than one, but I’ve got to try it! Paula I am glad you had fun trawling thru my year of quilting. I hope you will come back and visit again.